Between 1966 and 1971, I encountered the yin/yang symbol, turned 21, got hooked on Shakespeare and the history of the English language, discovered M.C. Escher’s work, graduated from college, became eligible for military service, got married, smoked a lot of pot, had a job in the food service industry, remembered that I was an artist, and wondered how to become one. Bobby Kennedy and Martin Luther King were assassinated and my father died, all within a six month span. The war in Vietnam and the protests against it spiraled completely out of control. And the best music of our lives was the sound track to all of that. It was the worst of times and, in some ways, it was the best of times. Searching for some semblance of balance and meaning in the early years of my adulthood, I kept coming back to the yin yang symbol. And Escher’s world of multiple viewpoints. These, joined with my love of words and my need to express ideas visually, led to my discovery, and to some degree, invention of what would later become known as ambigrams. As I nurtured my skill at this unheard-of art form, I tried to create an ambigram with any name or word that occurred to me. But eventually, there seemed little reason to create words like BROCCOLI or ARNOLD or FEATHERS that could be read from two different vantage points. Over the same several years, however, I had been trying to figure out how the yin/yang symbol itself could also be imagined and seen from multiple viewpoints. And the more I pursued those mercurial concepts, the more aspects of life seemed to make sense. I began to create ambigrams of words like PHILOSOPHY (the practice of looking at ideas from more than one vantage point), AMBIGUITY (a situation where there can be more than one valid interpretation), as well as BALANCE and POLARIZED, and INFINITY. 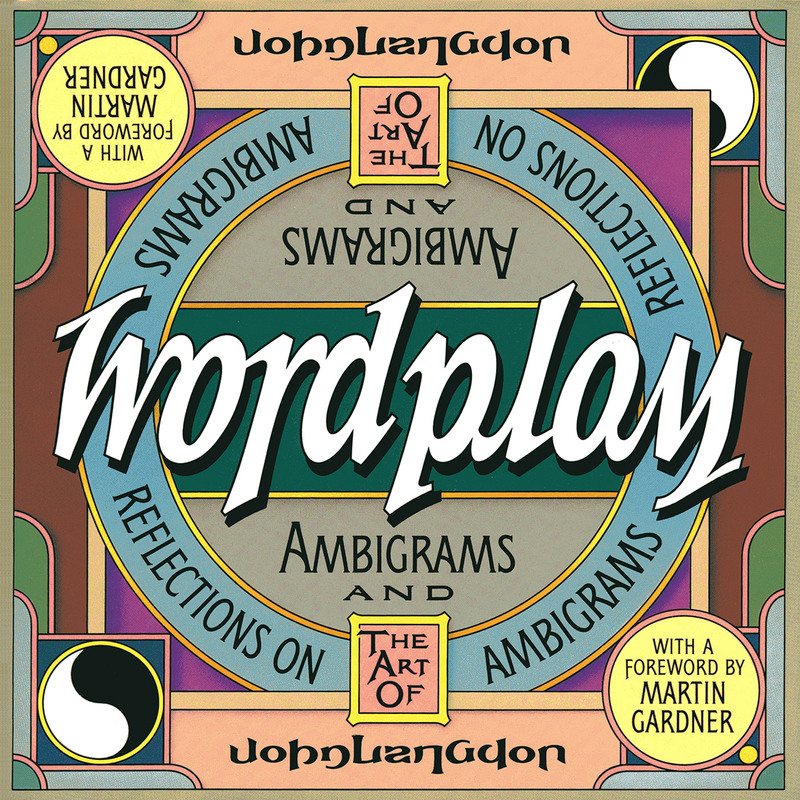 Wordplay contains more than fifty such ambigrams, and all are accompanied by brief and entertaining essays that explore the varied ways in which each word can be pondered, and understood. The texts may refer to the origins of the word, the relationship between the word’s meaning and its graphic representation, or the curious resonance between Western science and Eastern philosophy. Both graphically and logically, Wordplay establishes the relationships among the infinity symbol, the normal bell curve, yin and yang, wave patterns and helixes. And ambigrams. Wordplay was first published in 1992 by Harcourt Brace Jovanovich. It caught the attention of a young novelist, Dan Brown, who was inspired to build the plot of his second novel,Angels & Demons around ambigrams he commissioned me to design for the book. In 2005, a second edition of Wordplaywas published by Broadway Books, as Dan’s huge bestseller,The DaVinci Code had brought much attention to his earlier Robert Langdon novel, and thus to my ambigram work. The second edition features many recent ambigrams and a Foreword by Dan.